Being much more than a simple tube filled with ink, a writing instrument takes a quality design to make it mightier than the sword. As such, the internal parts have to consist of the highest quality and dependability and that means precision crafting of the internal components. The way to achieve this is by using small, deep drawn parts that are constructed of the correct material and formed into shape with modern techniques. 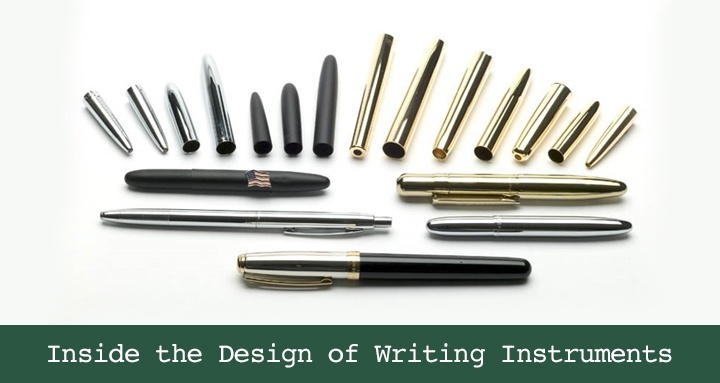 When designing a writing instrument such as a quality pen, the precise nature of the inner workings of the pen depend on the quality and construction of the component elements. From the roller tips to the shells, barrels and housings, all have to come together in a seamless form to make up the instrument. To construct these small deep drawn parts, it starts with material selection. A highly important aspect to the design process, the right material can make or break a part. Deep drawn manufacturing can use a variety of metals and materials to produce highly crafted and super small parts that can withstand the pressures and tensions encountered in a writing instrument. Small parts, such as tubes, overshells, plunger covers and more are required to be seamless and without failure points. Traditional stamping can adversely affect the strength and composure of different materials and thus create failure points in these small parts. Deep drawn manufacturing works with the material in such a way as to produce a seamless part without stressing the metal beyond its capabilities and therefore creates a solid part that can withstand design pressures and in some cases exceed them. Beyond quality and material considerations, small deep drawn parts can easily be produced in large runs while maintaining the quality of the material and thus producing a cost effective means of production. The very nature of the deep drawn process facilitates lower overall costs on a per unit basis. This can have a positive net effect on the number of parts required and thus the number of components used in the final end result. Therefore having a corresponding effect on the design processes. Deep drawn manufacturing is a perfect solution for the creation of small precise parts for a wide range of applications. When it comes to producing a high end writing instrument, this manufacturing process can deliver a cost effective solution that provides both quality and quantity components that are dependable, as well as being produced quickly. That only adds to your bottom line.